The Democratic Governors Association failed to list her campaign as a priority target, and openly stated she had little chance of winning. Wendy is not a happy camper, and is lashing out. the demographic)… Those same polls show her down by 8 points among Texas women. Oops. One has to wonder why he didn’t do so back when she made the statement her opponent (who is confined to a wheelchair) has not “walked a mile in her shoes”. That and her “Stand with Wendy” slogan are at minimum pretty tone deaf given she’s part of the party of political correctness. 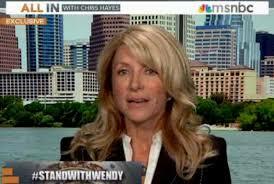 Yet Wendy’s current campaign has been heavy with folks associated with Obama campaigns… and early on her finance reports showed 60% of her donors were not Texas residents. Apparently Texans aren’t wild about electing a Trojan Horse loaded with failed ideas crafted out of state and funds originating from DC, Chicago, NYC, etc. Gosh, who could’ve predicted that? Texans don’t like carpetbaggers… or “do as I say not as I do” rhetoric. Sorry Wendy, maybe you should try running in California or some other state where your big government message resonates with voters. Texas isn’t for you. Anyone that disagrees… feel free to bet me a steak dinner she’s elected. By the way… I’ll take my steak rare. Next Post Note to RW: The meek will inherit the earth, but do you REALLY wanna wait that long?